Where are you from? Your professions? John worked as a Miami-Dade County firefighter/ paramedic. Beth worked as a registered nurse. We both retired in November 2009 and live in Naples, Florida. When and how did you become interested in paddling? After retirement, we finally had the time to pursue new activities and interests. We both love to be outdoors and active, so paddling was a natural fit for us. Where is your favorite place to paddle? We love paddling and camping in the 10,000 islands, but we also enjoy exploring the springs/rivers of northern Florida. How many Paddle Florida trips have you gone on and to where? We have been on several Paddle Florida trips. Our first one was the 2014 Ochlockonee trip: a fun wet rustic paddle. We then attended the 2015 Suwanee River Paddling Festival weekend trip. 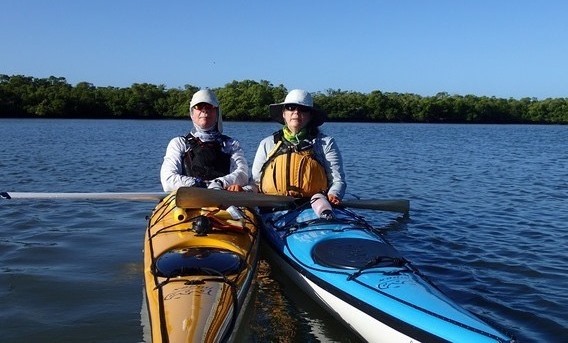 In December 2015 we did the Bartram History Paddle and February 2016 the Great Calusa Blueway. And we should just have completed the March Ochlockonee trip, which was so much fun we opted to go again! What keeps you coming back? Paddle Florida trips are addictive. They satisfy our desire for adventure, kayaking, and camping. Can you describe a Paddle Florida trip highlight? The Bartram History Paddle was amazing. We were immersed in “Old Florida,” following Bartram’s 250-year-old trail with Sam and Dean’s guidance. What advice do you have for folks considering a Paddle Florida trip? If you love paddling and camping, then pack your gear, load your kayaks, and go with the flow!